Rough and natural come together with Annette Görtz and Black Crane. The Annette Görtz beige leather jacket is a neutral layer over the Black Crane deep teal linen shirt. 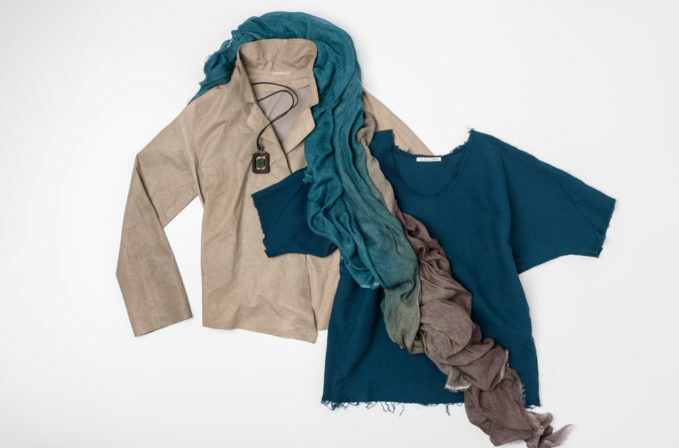 To keep with the beige and blue combination, the Faliero Sarti ombre scarf has teal, grey, and charcoal that also ties together the Lou Zeldis jade necklace.